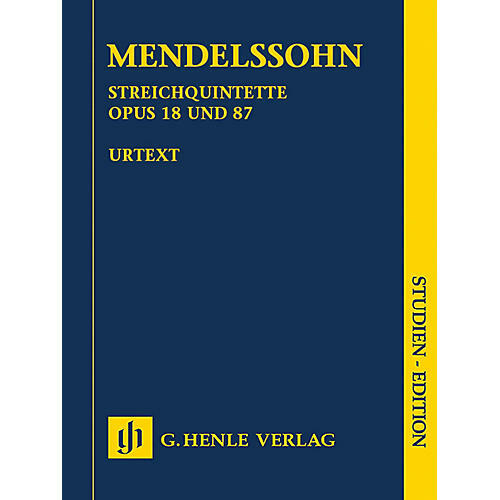 The genesis of Mendelssohn's string quintets is closely connected to his friend Eduard Rietz and the latter's brother Julius. Deeply affected by Eduard's death in 1832, Mendelssohn exchanged the Minuetto movement in his A major Quintet op. 18, written six years previously, for a newly composed adagio. It was in this form that the work was finally sent to the publisher. The Quintet in B flat major was only published after Mendelssohn's death; numerous, unauthorized entries by Julius Rietz thus found their way into performance practice. An examination of the autograph allowed Henle to return the work to its original form - the commentary contains detailed information on this.